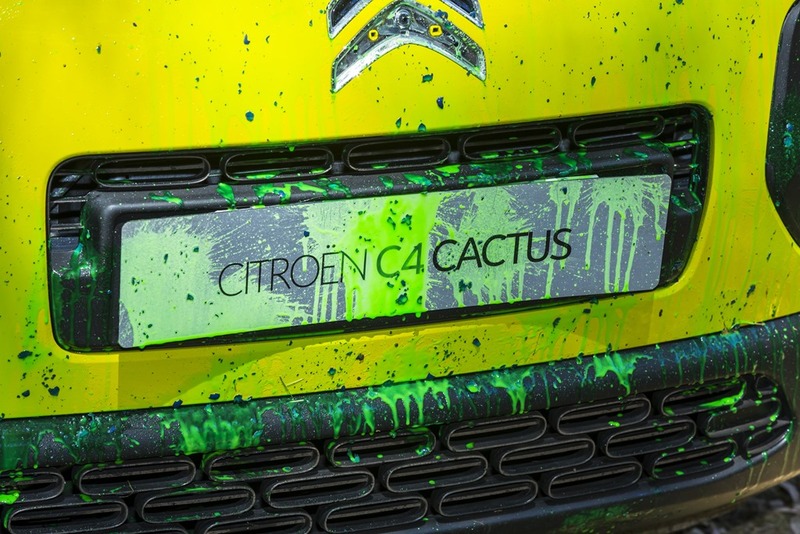 Citroen chose a hot day in March to launch its new Cactus. 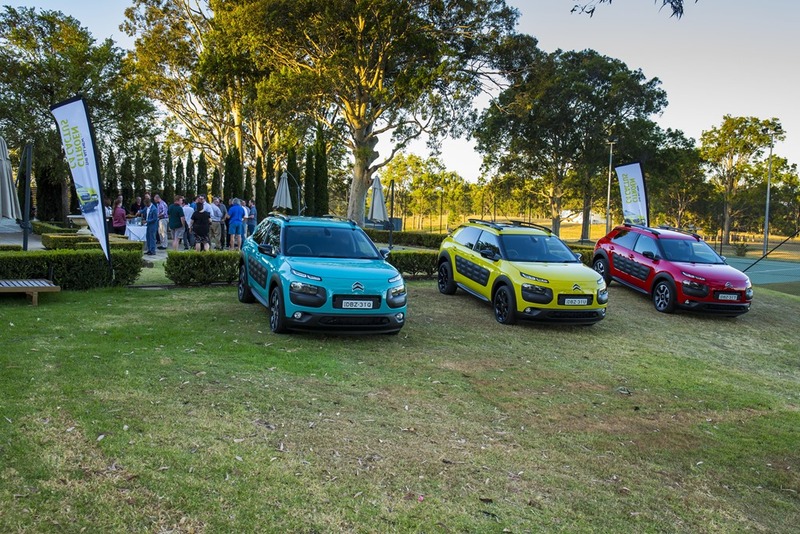 Set amongst the Hunter Valley’s vineyards, winding roads, and romantic vistas, the Cactus performed perfectly. 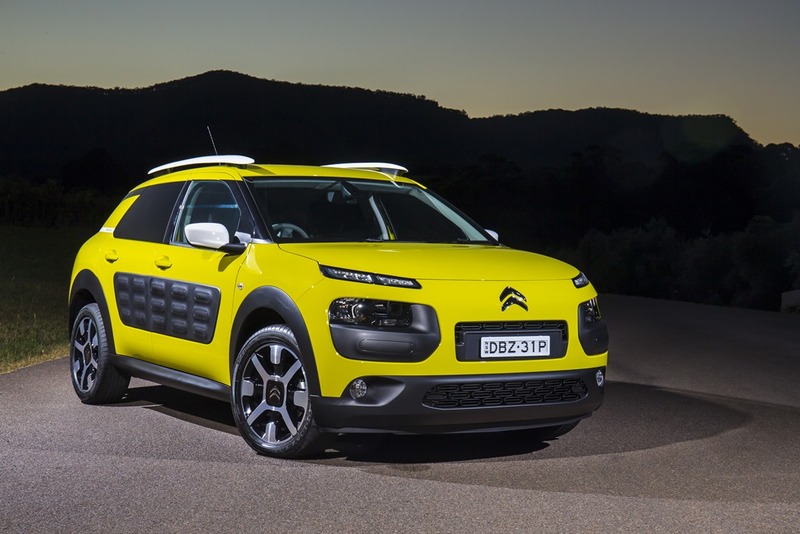 Rugged, handsome, and unusual, are the words I’d use to describe the exterior of the Cactus. 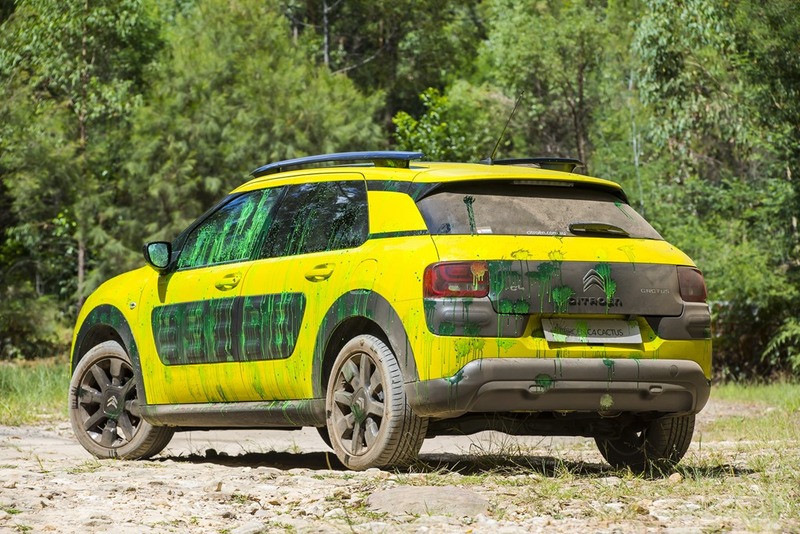 The standout feature is the airbump which Citroen says protects the car like the spines of a cactus plant. Please see shopping trolley demo. They were tested in extreme temperatures between -30c and +80c. I can’t imagine who would be driving in those temps though unless you’re pretending to be in a movie about climatic Armageddon. They really work. Do I like them? I don’t know, let me get back to you. The Cactus is a cross between a crossover, a hatch, and a wagon and bridges gaps, or something like that. Cactus looks back to the 2CV for inspiration carrying 5 people in relative comfort, so there are 5 doors to get plenty of stuff in. 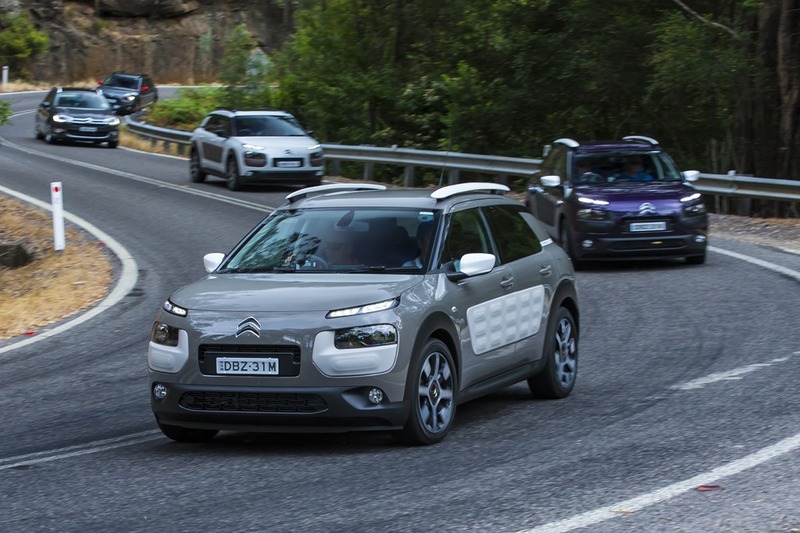 The small SUV is the fastest increasing segment, so perhaps Citroen is killing 2 birds with 1 stone: a c segment hatch, and a small SUV. I’d like AWD added, where I think Cactus would kill the dull as dishwater opposition. I like the looks but can understand they might not appeal to everyone. Spacious, roomy, and funky are my words dujour. The “lounge” seating does what it says on the box. The way the fabric has been applied to give the impression of a lower seat back which looks to be the height of a classic DS front seat. The dash is a couple LCDs displaying driver info. 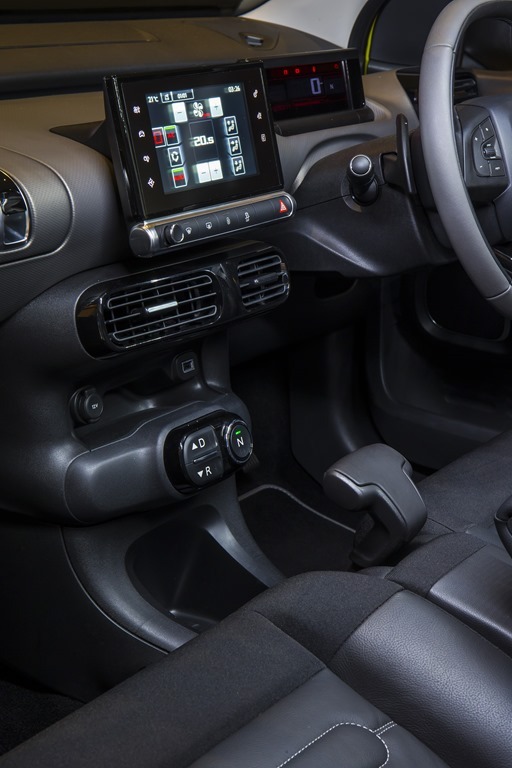 The Centre Screen includes standard Satnav and vehicle customization options, as well as the audio system and air cond. The infotainment system takes a little while to initiate once the ignition is turned on. The A/C doesn’t come on until the screen has gone through its little routine, which is mildly annoying but nothing I couldn’t live with. There are big bins for flotsam with some being big enough for a couple of 1.25L soft drinks. The atmosphere reminds me not only of the 2CV, but the fabulous DS of the 60’s. The attention to detail in the glove box cannot be overstated. You open it upwards, and your bits and pieces won’t spill onto your lap. This is possible because of the airbag which is located in the roof rather than the dash board, a world first. I like the straps across the glove box, and on the door pulls which is a nod 30’s luxury travel. The Australian launch was delayed because of the lack of a centre child restraint in the rear, as if you’d want to have 3 children in the back seat (or one for that matter). It was fixed, just for us. The rear door window is a pop-out affair like 3door hatches of the past. Some won’t like it, but those with kids will see a clever advantage that needs no explaining. Also, anyone who has ever been in the back seat of a classic Mini will know that friend giving you a lift to the airport is better that a taxi, so shut-up or they’ll dump you onto the footpath! The rear door had huge bins because there is no need of space for glass to wind down. This means there is plenty of scope for cocktails on the way to your flight, as you slowly begin to care less about your surroundings, and more about your cocktail. The cargo bay is 358L with the rear 60/40 split seats up, and 1170L with them down. All in all, cheap, yes, but certainly not nasty. 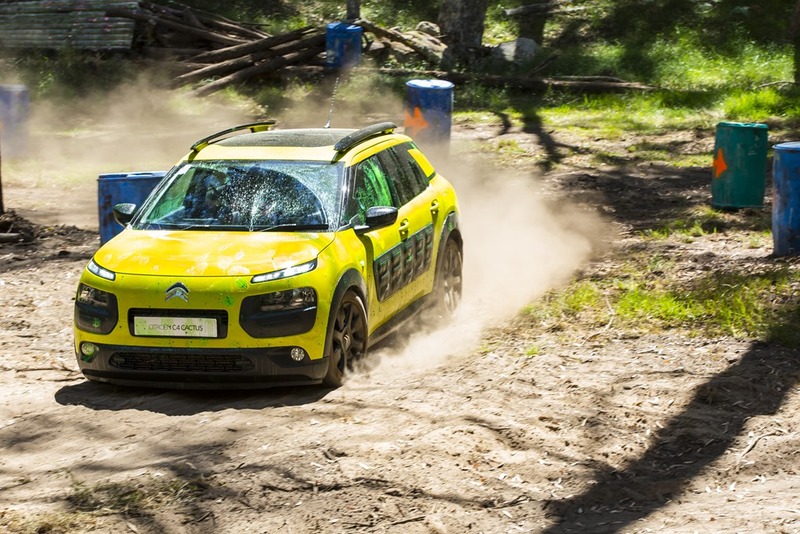 Driving the Cactus is not unlike the old 2CV, minus the lack of comfort, frightening leans in corners, complete lack of modern comforts, and the power of a tinyt toy sewing machine. There is a small efficient engine (pertrol or diesel) and a 5 speed manual or 6 speed semi auto. The 3cylinder 1.2 turbo petrol has a sparkling 81kw and a respectable 205Nm. Now, before you pooh-pooh the modest output, I’d like to point out that my old BMW 318i had 83kw and did 0-100 in 12 seconds. 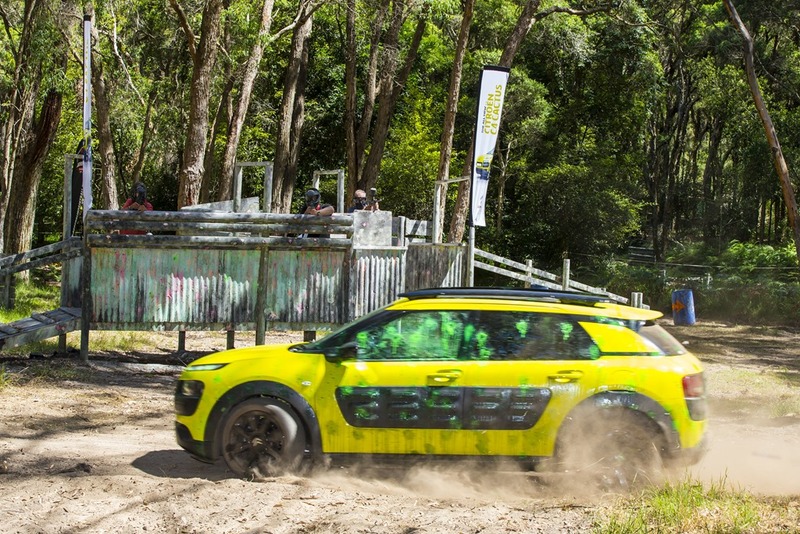 The Cactus does it in 9.3 and the semi auto 1.6 68kw/230Nm diesel in 11.4 seconds. It’s horses for courses and if you want a zippy sports car, buy a zippy sports car not a CACTUS. There will no doubt be some who will cry soporifically into their soup about the lack of power. To them I say PFFFFT! 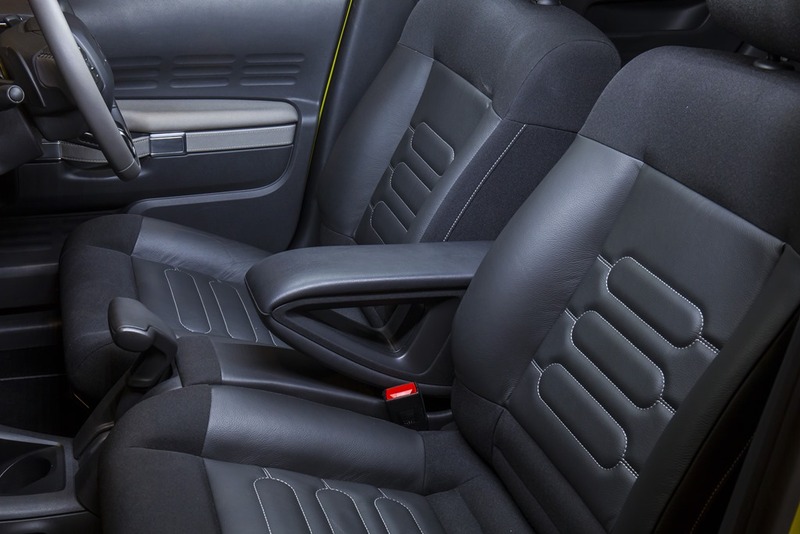 It takes a bit of fiddling to get the seat just right but when you do, the position is comfy and you feel like you might sit for hours without feeling cramped. I could imagine an owner getting very attached and quite emotional because Cactus feels alive, like a slightly naughty child. In fact, the original 2CV could take a rotund farmer, and his ample missus, over a freshly plowed field with a basket farm-fresh oeufs and a bottle of vin rouge without any coming to grief. I reckon Cactus could probably do that too. Note to self: ask Citroen for a lend of a couple of farmers. The Citroen people made a big deal about the “magic wipers” and showed a video of the wipers wiping. 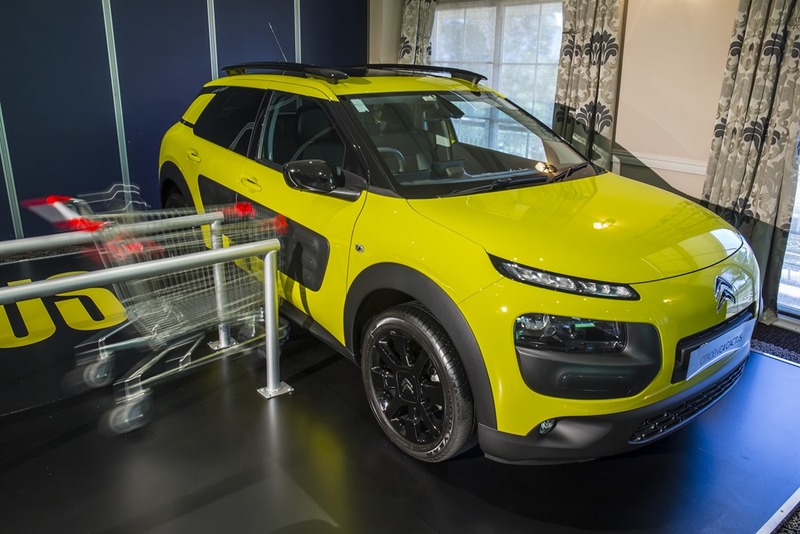 It was underwhelming, until the bit came on which compared the Cactus wipers to a normal car. The Citroen left the windscreen clear at all times and wiped almost all of the water away. Other cars left the driver’s vision obscured to the point of temporary blindness. 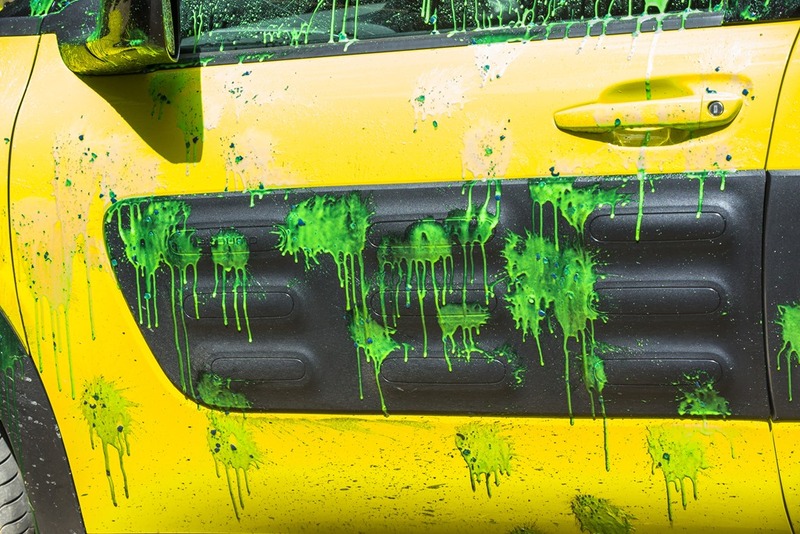 It gives a single swipe first leaving a trail of suds on the way back. The downside is the first wipe is on a dirty windscreen which always made my dad’s teeth clench. I’d like to test them further on a really grubby surface to see how they go. The diesel is a great little engine but the semi auto hampers it somewhat. 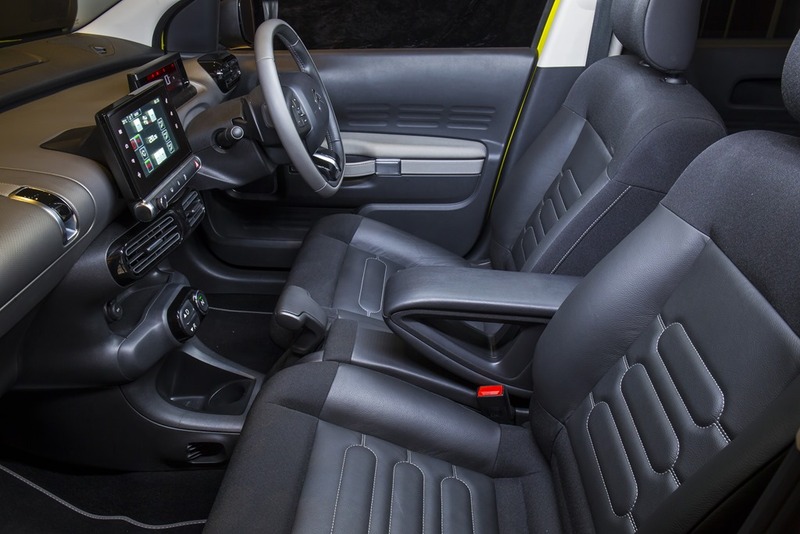 Even if you choose to change the gears with the paddles, you have to lift your foot off the accelerator a little to avoid lurching forward in your seat. The is no manual mode so it may well change up, or down, when you don’t want it to. Although it is a vast improvement over the dire 508 Ehdi from sister company Peugeot, it just doesn’t float my boat. There is a beautiful 6 speed auto in other Citroens, so I’m disappointed that they would choose the semi auto option. 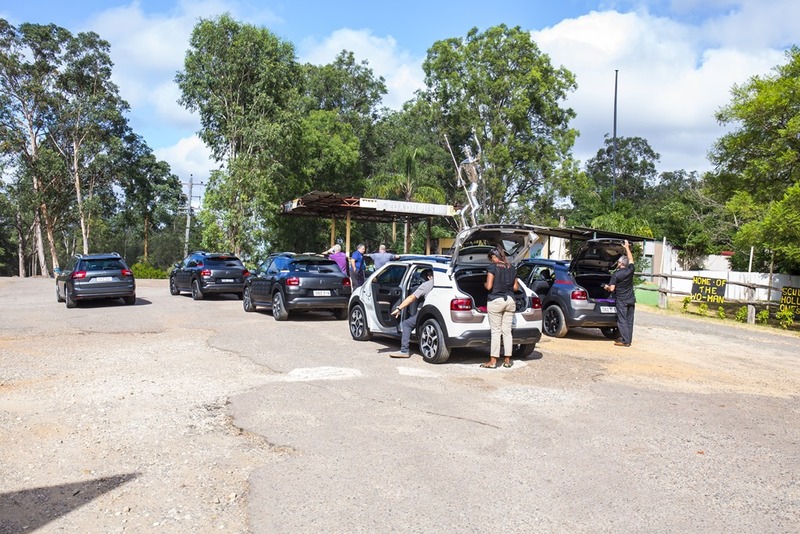 Worse still, marketing selected a manual only petrol and semi-auto only diesel for Australia. My hope is that it won’t make much difference once people get used to it. The cute Cactus deserves to be loved like the 2CV was. In traffic, both drivetrains have sufficient flexibility to cope well while still being frugal. Remember, this is not a performance sports car, it is light and “cost effective” (cheap, to you and I). What was really surprising was how well it coped with high speed cornering. Our drive took us through town and country over, We did and 400k’s with an added bonus of being able to bang a shopping trolley into the door, and shoot paint pellets at it. The only damage sustained was a tail light cover, and a rear badge. No Cacti were harmed in the writing of this story. 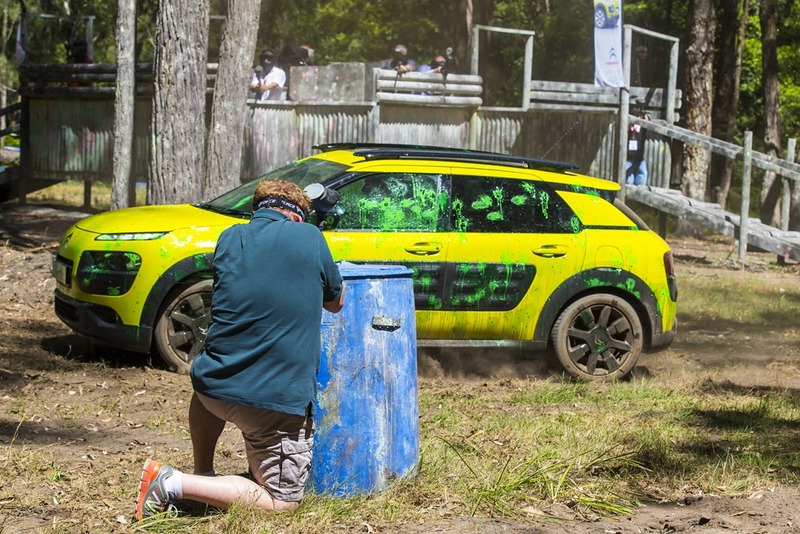 But, I digress, the country run really showed what a brilliant car the Cactus really is. A gravel section had bumps almost as vicious as the paved bits. We were, after all, in New South Wales. The front-wheel-drive did as well as can be expected in spirited dirt driving and we both felt safe and comfortable. I’ve driven cars costing 5 times as much over similar roads recently, and required both chiropractic and dental work after. Cactus was spookily smooth and surefooted. Pushing the Cactus through corners felt exactly like a 2CV. No matter what bumps we encountered you always felt controlled and calm. All Cacti come with Satnav and a pretty fab infotainment system. The sound is far better than a cheap car has any right to be, and is completely intuitive to use. Even the auto climate controls are in a menu which makes the console look clean and neat. Some will say air conditioning controls should be left on the centre console. I don’t know, what do you think? I don’t like the semi auto but I could live with it. I’m a grumpy old man now so no one would notice me grumbling about something new. It certainly wouldn’t stop me from loving it to bits. The glass roof option is a waste of money. It adds both weight and cost and doesn’t have an interior blind. Perhaps a fabric sunroof a la 2CV might have added that that certain something without adding weight. Cactus is fun to drive, cheap to buy, well designed and fairly comfortable. There is plenty of room and lots of customization via at-cost options. 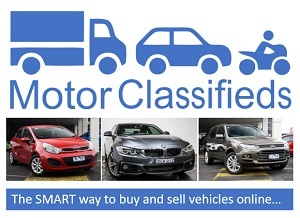 You can have bumps and mirrors in different colours, different wheels, a white roof rack instead of black, and any number of other nuances. Or, you can just have the basic car in petrol for $26,999 and a diesel for $29,999. I like it, I like it a lot. It’s cute and cheap. Keep in mind, it is unlikely I’d be in the market for an SUV of any size. If I was buying a hatch, I’d buy a hot hatch. A Fiesta ST is cheaper and drives better, but of course is smaller and a completely different kind of car. The fact remains that Cactus is fabulous and pokes fun at itself, and I like that. It will appeal as much to a hipster as much as it will your nan, and is as easy to drive as a shopping trolley. The looks are a “take it or leave it” thing which, again, I like. Finally, there isn’t much else on the road like it, so uniqueness can be added to my other “words dujour”. Would I buy one? Yes, if I was in the market for a small SUV-like car, why not.